The past couple of years, I've developed an affinity for non-fiction comics. They have all the elements of the medium that I enjoy, plus I usually learn something from them. Closely related to non-fiction is historical fiction. Typically, these take elements of history and try to tell stories around the periphery. They try to give a feel of what things were like for the people who don't show up in the history books. That's where Phil Gelatt and Tyler Crook's upcoming graphic novel, Petrograd, comes from. It's set primarily in Russia during World War I. Agent Cleary, a British spy, is trying to keep tabs on things from his connections with the Russian secret police and, where possible, push events in directions that are more favorable towards Great Britain. It's in this fashion he picks up on some drunken ramblings of Prince Felix Yusupov, who suggested killing Grigori Rasputin to quit his influence on the Tsaritsa. Cleary nudges the plot forward and, despite his efforts to remain removed from the assassination attempt, winds up in the final struggle. Cleary is then sold out to the police, with the British government claiming he's gone rogue. Cleary manages to escape but is left to try to start a new life for himself. Almost any story involving the death of Rasputin is going to contain some element of fiction. First-hand accounts at the time varied, and the original documents were destroyed in one fashion or another. Further, his reputation at the time suggested he had magic powers and it was easy for people to believe exaggerated stories about him. Consequently, we don't definitively know how he died. 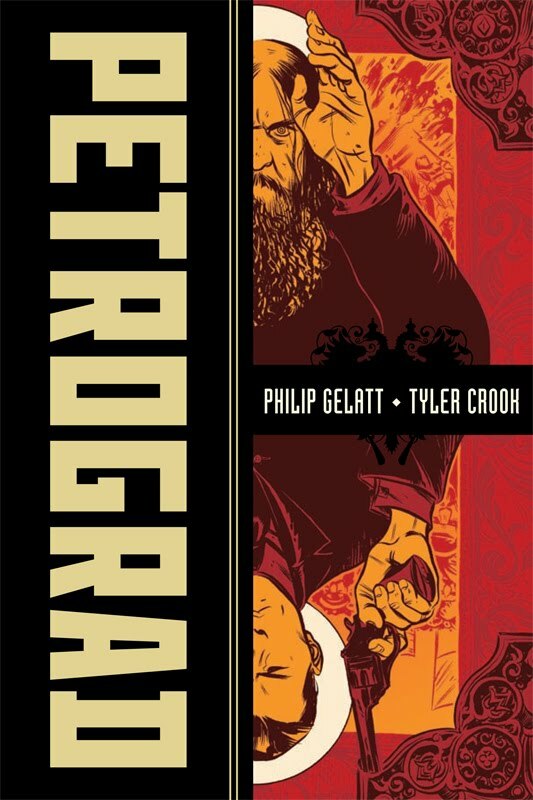 What Gelatt and Crook have done, then, is take the best information that's available, and try to craft a compelling, logical tale around that. The secret service, the involvement of the Prince, the motives... all of that fits in just about perfectly with what we do know. From what I've gleaned, the only significant change is that Cleary appears to be a fictional stand-in for someone named Oswald Rayner. But otherwise, it all seems pretty accurate. So, while this is technically historical fiction, it's probably closer to non-fiction than many other supposedly non-fiction books and, from that sense, was incredibly fascinating for me. The artwork is beautifully rendered in orange/red duotones throughout. I did have a little difficulty discerning individuals in a few scenes where people were bundled up heavily to ward off the cold outside (that a couple were cross-dressers didn't help matters) but considering how little I knew of Rasputin and Russia's involvement in WWI prior to reading this, it still wasn't that difficult to follow along. Certainly, once the story got rolling and I established who all the characters were -- about two dozen pages in -- things progressed along nicely. Although that two dozen pages might sound like a lot, keep in mind that the whole book is 274 pages long and the actual murder of Rasputin, beginning with his first sip of poison, takes over 40 pages. All in all, I quite enjoyed the book. I think it's an excellent example of taking real events to tell a gripping story. Especially in light of how much Rasputin floats in the public perception as this vague and mysterious, almost mythical, villain, I think Petrograd does a superb job of showing what people really thought of him and what he was really like. Oh, he's still plenty villainous, and that helps to make this a compelling story, but he's villainous in a decidedly more debauchedly human way than he's often depicted. Writers don't NEED to make embellishments to make Rasputin the bad guy, and that's part of what makes Petrograd successful.